Grandfather Mountain State Park offers more than 12 miles of trails lacing 2,456 acres along the mountain's ridgeline and its highest point at Calloway Peak. The trails offer magnificent scenery from rock outcrops and quiet forested coves near the mountain's crest. Permits are required. Most of these trails are challenging; steep, rocky terrain can make progress slow at times. Hikers must use the trails' ladders and cables in some of the steeper sections. Be aware that hiking to the ridge area and back from the low-elevation trailheads may take a full day. Plan for enough time to get back to your vehicle before dark. And, wear proper clothing and carry adequate equipment. Grandfather Mountain attraction employees and state park rangers patrol trails on a routine basis to offer help and directions, check for permits and monitor use of the backcountry. Location: (GPS: 36.095595, -81.828517) Hikers can access the Black Rock Trail from the Black Rock Parking Lot inside the private Grandfather Mountain attraction. From the attraction's Black Rock parking lot, the Black Rock Trail slopes out gradually to a wide-angle view of the swinging bridge, MacRae and Attic Window peaks as well as Beacon Heights and Grandmother Mountain to the southwest. To reach these view points at the end of the trail, hikers must climb a ladder and cable up the rock. 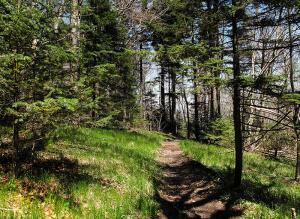 This trail rambles through northern hardwood and spruce forests. Hikers return to the parking lot via the same trail. Point of Interest: At the end of the one mile trail, hikers may climb a ladder and use cables to assist their ascent up rocks to view the swinging bridge, MacRae and Attic Window peaks as well as Beacon Heights and Grandmother Mountain to the southwest. Location: (GPS: 36.118197, -81.790846 at Nuwati Trail) (GPS: 36.111684, -81.794004 at DBS Trail) The Cragway Trail is a connector trail between the Nuwati and Daniel Boone Scout Trails. A steep, strenuous hike with grand vistas. 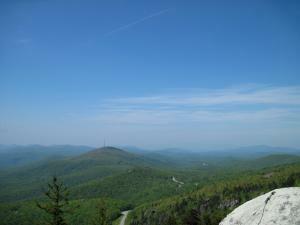 Boulders and crags offer elevated views of the Boone Fork area and Calloway Peak. This trail links Nuwati and Daniel Boone Scout trails, making a nice loop hike passing through rhododendron and blueberry thickets. Due to the narrow, steep terrain, this trail is not recommended for dogs. Location: (GPS: 36.113793,-81.780963) Hikers can access the Daniel Boone Scout Trail from the Boone Fork Parking Area on the Blue Ridge Parkway (Milemarker 299.9). From the parking lot, follow the Tanawha Trail for 0.6 miles to the Daniel Boone Scout Trailhead. Ascending about 2,000 feet over three miles, this hike begins at the Blue Ridge Parkway’s Tanawha Trail and climbs to Calloway Peak, at 5,946 feet, the highest point in the Blue Ridge Range. About halfway up, at Flat Rock View, hikers reach the junction of Cragway Trail. The upper half of the Daniel Boone Scout Trail is rough going but spiced with exquisite views, including one of Price Park and one of the Linn Cove Viaduct. Near Calloway Peak, in-place ladders and cables help hikers through steep sections. The upper portion of this trail is not recommended for pets. Point of Interest: The 5946' Calloway Peak is at the summit of the Daniel Boone Scout and Grandfather Trails. Calloway Peak is not only the highest point on Grandfather Mountain, but the highest point on the Blue Ridge Range. 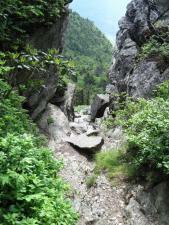 This trail begins in the Black Rock Parking lot and ends at the Grandfather Trail, below a grand view of MacRae Peak. Connecting this trail with the Grandfather and Bridge trails creates a loop. Not recommended for pets. Location: Ridgeline - running between Calloway Peak and the private Grandfather Mountain Swinging Bridge parking lot. (Elevation gain and loss over 2.4 miles is roughly 1,872 feet.) 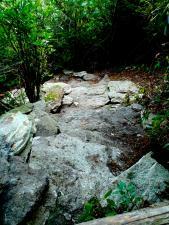 The Grandfather Trail runs the length of the summit ridge from the Grandfather Mountain attraction to Calloway Peak. It offers astonishing variety, running in and out of wind-dwarfed spruce and fir, across or around rock walls and pinnacles and into open spaces with mountain views in every direction. It was along this trail two centuries ago that explorer/botanist Andre Michaux broke into song thinking he had arrived at the high point of North America. The pace is often slow. There are chutes where progress is hand-over-hand and extra steep sections where hikers use in-place cables and ladders. 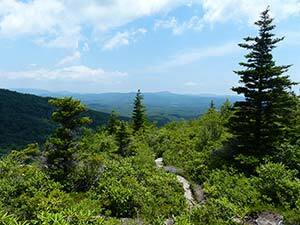 An alternative to taking the ladders up MacRae Peak is to opt for the more sheltered Underwood Trail. Not recommended for children, inexperienced hikers, or pets.